The TRIM Saved Search asset allows you to configure a set of TRIM search criteria in Squiz Matrix, storing and updating the results of the search on the system. These results are stored as Data Source Record Set shadow assets and can be used with other Squiz Matrix assets to provide additional TRIM functionalities. For more information on the functionalities of the TRIM Saved Search, refer to the examples in this manual. Tip: A TRIM Saved Search should be created within a Site with an assigned URL. TRIM Saved Search assets without a URL will not function correctly. Once created, you can configure the settings of your TRIM Saved Search on its associated asset screens. These screens are often the same or similar to those for a Standard Page and are described in the Asset Screens manual. In this chapter, we will describe the Details screen, which is different for a TRIM Saved Search . The Details screen for the TRIM Saved Search allows you to configure the asset. For more information about the Status, Future Status, Thumbnail and Details sections of this screen, refer to the Details chapter in the Asset Screens manual. This section allows you to configure the connection to the TRIM system, creating the TRIM bridge for the saved search. WSDL: enter the URL to the WSDL of the TRIM system. This section allows you to select a TRIM Connector with a configured connection to the TRIM system, creating the TRIM bridge for the saved search. The Use a Connector Asset section of the Details screen is shown in the figure below. In the TRIM Connector Asset field, select a configured TRIM Connector to use as the TRIM bridge for the saved search. Tip: If a TRIM Connector has been selected in the TRIM Connector Asset field, the Connection Setup section fields will have no effect and, therefore, do not need to be completed. This section allows you to manage the results of the TRIM Saved Search. The Synchronize Options section of the Details screen is shown in the figure below. Download Files: select whether or not to enable the downloading of attachments of record sets. Attachments are the electronic documents of a record, such as a text file. If this option is set to Yes, the attached documents of the listed TRIM records will be available to download. By default, this field will be set to No. File Size Download Limit: enter a size limit (in bytes) of attachments downloaded to Squiz Matrix on the TRIM Saved Search. By default, this option will be set to 4194304 bytes (4mb). Synchronize Timeout: specify a time limit (in seconds) for the sychonisation process of the TRIM connection. If this process exceeds this set limit, the TRIM Saved Search will display a warning. By default, this option will be set to 7200 seconds. 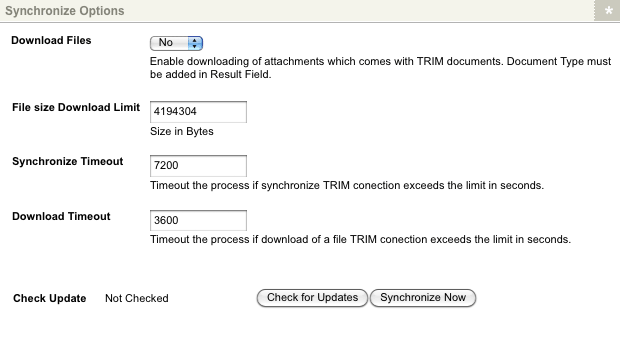 Download Timeout: specify a time limit (in seconds) for the downloading of attachments on the TRIM connection. If the download process for an individual file exceeds this set limit, the TRIM Saved Search will display a warning. By default, this option will be set to 3600 seconds. 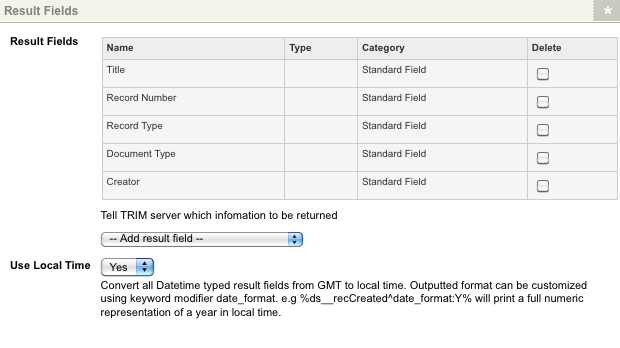 This section allows you to request standard and additional metadata fields from the connected TRIM server. These fields can then be used in search queries for the TRIM Saved Search. The Retrieve Fields From Server section of the Details screen is shown in the figure below. To retrieve these fields, click the Retrieve Now button; a message will be displayed totaling the number of standard and additional fields that have been retrieved, as shown in the figure below. If no fields can be retrieved or the TRIM Saved Search is not connected to a TRIM server, the message EMPTY will be displayed. This section allows you to configure search clauses on specific metadata fields of the records on the TRIM system. These queries are constructed in groups of search clauses that can be linked with different search logic to determine the parameters of the search. The Search Fields section of the Details screen is shown in the figure below. To add a new group, select a search field in the -- Add search field -- list under the Add search field in a new group field. Once you have selected a field, click Commit. A new group will be created and additional fields will be available for configuring the query, as shown in the figure below. Tip: You can add additional metadata fields for selection to the -- Add search field -- list using the Retrieve Now button. If no additional fields have been retrieved, this list will only display the default fields for the TRIM Saved Search. For more information, refer to the Retrieve Fields From Server section in this chapter. To add additional search fields to a group, select a field in the -- Add search field -- list located under that group in the Search Fields table. Once you have selected a field, click Commit. The new search field will be created in the group. An example of a set of search clauses is shown in the figure below. Keyword: enter a keyword to query the specified metadata field on records in the TRIM system. the results of the TRIM Saved Search. 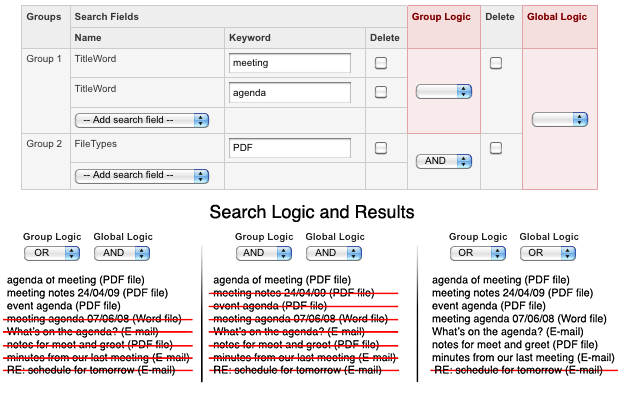 For example, in the figure above, the AND logic is used, meaning that only TRIM records that contain both meeting and agenda in their titles will be returned as results of the search. If the OR logic was selected, records that contained at least one of the keywords would be returned as results. AND: select this option if all group queries must be met on the results of the TRIM Saved Search. OR: select this option if at least one of the group queries must be met on the results of the TRIM Saved Search. Please note that Global Logic is used solely on a global level; individual Group Logic will be maintained when using multiple groups. The figure below shows how the Group and Global Logic work together within the TRIM Saved Search. This section allows you to select the metadata field information that will be returned on record results of the TRIM Saved Search. The Connection Setup section of the Result Fields screen is shown in the figure below. Please note that only metadata information returned on results can be used within Squiz Matrix. For example, if Record Number is not selected in this section, you will not be able to use the keyword replacement to call this information. Tip: You can add additional metadata fields for selection to the -- Add result field -- list using the Retrieve Now button. If no additional fields have been retrieved, this list will only display the default fields for the TRIM Saved Search. For more information,refer to the Retrieve Fields From Server section in this chapter. Tip: You can customise the output of these date formats using the date_format keyword modifier (e.g. will print the full numeric representation of a year, in local time). For more information, refer to the Concepts manual. This section specifies a Trim classification to restrict the saved search results to. For example, you could restrict search results to only contain records that have the Projects classification. The Classification Options section of the Details screen is shown in the figure below. This section determines the general search options for the TRIM Saved Search. The General Search Options section of the Details screen is shown in the figure below. Search Parent Container: enter the parent container to search in. For example, entering 09/1 into this field will only search the 09/1 container of the TRIM system. FileTypes: enter a file extension to limit the saved search results to that specific file type. For example, entering pdf into this field will only return TRIM records that are of the PDF file type. This section allows you to select how the record set results appear in the Asset Map. The Record Set Asset Names section of the Details screen is shown in the figure below. In the Record Set Asset Names field, enter a string to use as the asset name for the record set results of the saved search. Keyword replacements can be used in this section. For example, if the keyword replacement is entered into this field, the record set assets will be named after their document type, such as TIF Image. If this field is left blank, the record sets will be named Data Source Record Set <assetID>. For a list of available keyword replacements, refer to the Available Keywords section below. 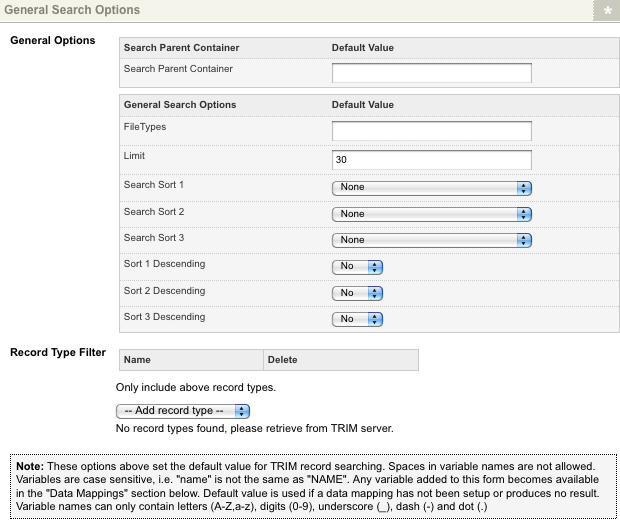 This section lists the available keyword replacements for record set assets of a saved search determined by the attributes of the record sets in the TRIM system. These keyword replacements can be used either in the Record Set Asset Names field or when listing the saved search results on a TRIM record listing. For more information, refer to the Listing TRIM Saved Search Results on an Asset Listing Page example in this manual. Please note that these keyword replacements will differ depending on the available attributes of the TRIM system and, as a result, they will only appear once a TRIM bridge has been established and Committed in either the Connection Setup or Use a Connector Asset sections. When a TRIM Saved Search is first created, the Available Keywords field will read No keywords available – this data source, as currently configured, does not have any record sets, as shown in the figure below. TRIM records that are found as results of the saved search are displayed as Data Source Record Set assets, under the TRIM Saved Search asset in the Asset Map. For more information about the Status, Future Status and Thumbnail sections of this screen, refer to the Details chapter in the Asset Screens manual. Tip: TRIM documents specified as Data Source assets in Squiz Matrix are updated and downloaded automatically by the Update TRIM Cron Job, set to run on a nightly basis.